The Texas volleyball team celebrates the win over New Mexico State. (Photo: courtesy UT Athletics Photography). 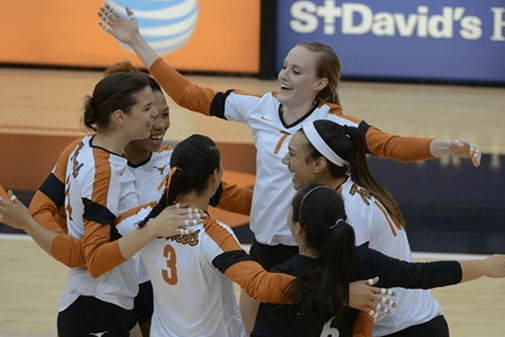 Texas Longhorns Volleyball defeated New Mexico State on Saturday afternoon in a spring exhibition game. The Longhorns defeated the Aggies 4-1 in a full five-set match(25-17, 25-8, 25-17, 22-25, 15-7).